England’s Royal Mint has been producing Gold Britannias since 1987. The biggest of all Britannias is the one ounce variety and in England it has a face value of 100 pounds. The other three sizes are ½, ¼, and 1/10 ounce Britannias. The face value of the coins in descending order are 50, 25, and 10 English Pounds. The face values of the coin may be fairly low but the actual value of the coin, because of the pure gold in it, is much higher than the face value. While the actual value may be fairly high, it is important to consider the fact that gold’s value is always rising. On the Gold Britannia, the most prominent image is that of a standing Britannia figure. This particular image resembles the image that was on the coin Henry VII florins. The image of the Standing Britannia was created by English sculptor Philip Nathan, as is the case with the Silver Britannia. The Britannia is one of the first pure gold coin in the UK and this fact alone holds special significance amongst collectors and investors. These coins are part of English history and are surely a great addition to any coin collection. All 4 sizes of the Gold Britannia are 22 karat gold. This means they are made up of about 91.7% gold and about 8.3% is a copper filler. The copper was in the coin from 1987 until 1989, and then in 1990 they changed the filler to a more valuable silver. The filler metal is necessary because gold is such a soft metal, the silver is harder and therefore makes the coin harder and more able to withstand wear and tear and visible signs of handling. Keeping these coins in great position is a good way of preserving the value of the coin. 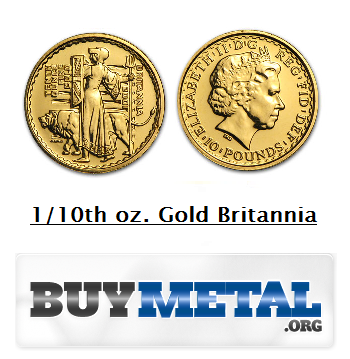 The smallest Gold Britannia, the 1/10 ounce coin has a diameter of 16.5 millimeters. These coins are perfect for the entry level investor or anyone looking to diversify. 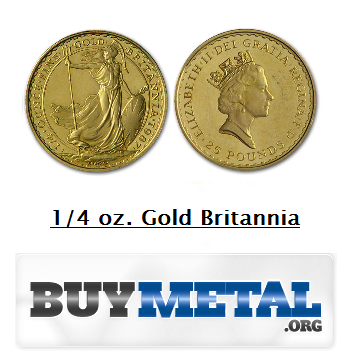 The quarter ounce Gold Britannia’s diameter is about 22 millimeters. These coins are popular among investors and collectors alike because while they are not the smallest size, they are still sizable enough to where they have sound value. 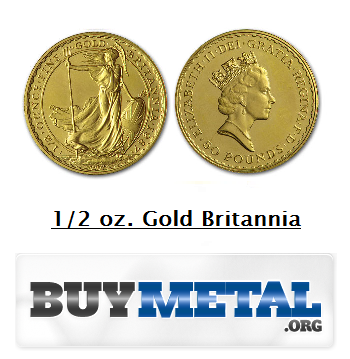 The half ounce Gold Britannia has a diameter of 27 millimeters. 1/2 oz. varieties of any gold coin are going to undoubtedly be expensive. While premiums aren’t outrageous, the gold content will justify the price for these. 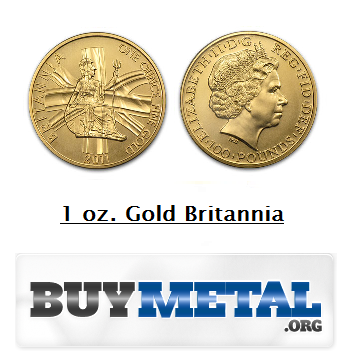 The diameter of the one ounce Gold Britannia has a diameter of about 32.69 millimeters. Serving as the staple for this issue, it is easily the most popular and well sought after versions on the market. Gold Britannias are popular for a number of reasons, one of the most popular reasons is that the UK passed a very helpful law in 2000. They passed a law that said government issued gold coins would be tax free in the UK. This simple law made the demand for these coins rise significantly. Because these coins are tax free in England, buying them within the UK would be the optimal, but for those of you that are unable there are plenty of other places to find the coins too. Apmex is always the best place to start your online search for Gold Britannias because they are the most popular choice in online coin buying. Because English influence is noticeable all over the world, the image of the Britannia can be historically significant almost anywhere.